Edward Sidney “Ted” Lines was born September 17, 1897 to Ambrose and Mary Ann Lines at Curries in East Oxford Township. He attended school at Curries, and after school worked on farms. He was drafted under the military service act in 1917. 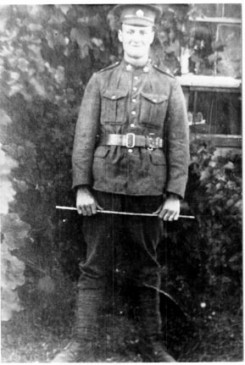 His medical exam was October 18, 1917, and his recruitment date was May 27, 1918 in London. He was then sent home to help put in the spring crops. He received his discharge certificate January 14, 1919. At the end of the war, he continued with farm work, and then went to work at a traveling saw mill owned by Art Griffin. He met and married Clara Louise Logan from Burford Township. They were married in Woodstock July 3, 1926. They continued to move around with the sawmill clearing bush until 1929 when they came to Con 7 Lot 5, West Zorra Township. They remained there and rented the property until Spring 1942. They grew vegetables, had a few cows, chickens and horses. They took their vegetables to Otterville Canners. Their oldest child Howard had been born in Tillsonburg Hospital when they were working and living near Ostrander. The next two children Donald and Helen were born on this farm. In May 1942 they purchased the farm on Con 6, Lots 6 and 7 and farmed there until 1972. Their youngest daughter Vera was born while they were living at this farm. They remained there until 1972, when they sold the farm and retired to a two acre property on Con 1 Lot 19, which was a portion off the Crawford farm. However by 1981 health issued caused them to move to Woodstock, nearer their family and doctor. Edward passed away in 1983, and Clara in 1991, both are buried at Oxford Memorial Park.